The installation exists in a glass square: 4 x 4 quadratic glass plates are supported by 5 x 5 wooden cubes. The cubes are not like a pedestal, they are integrated into the sculpture. There is tension between the fragile glass plates and the wood, tension between materiality and immateriality. Wood carries glass. 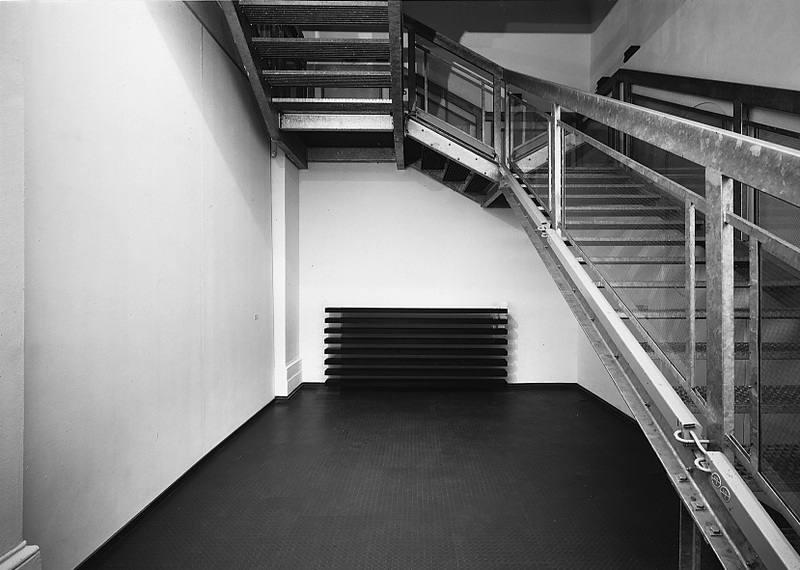 In the same space a second sculpture was installed, based on the same principles, but reversed: glass carries wood. 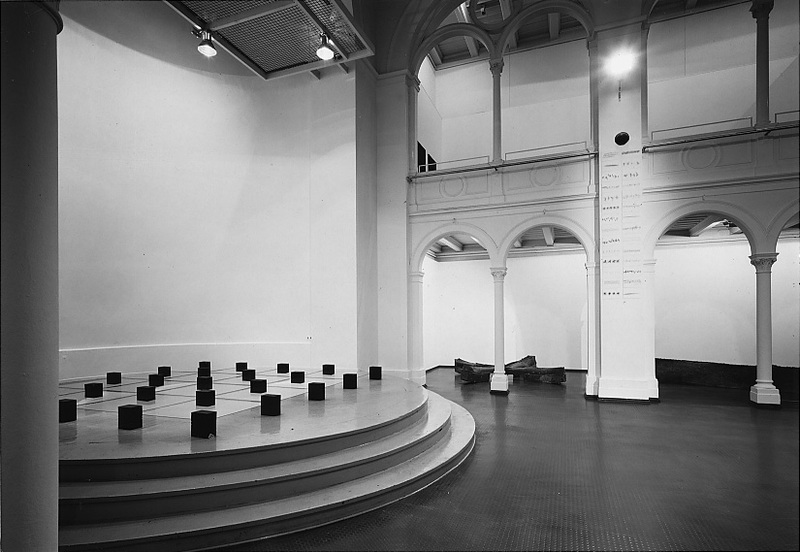 … back: In the beginning a sculpture stood here: quadratic four by four glass plates were supported twelve centimeters above the floor by five by five wooden cubes: a strict geometric order comprised of single components and which is, in principle, expandable. Formally and materially the work combines dichotomies: bodies and surfaces, opaque and transparent materials, and the principles of the post-and-lintel system. It is without a pedestal – unless one would like to consider the load-bearing wooden cubes as a pedestal, even though they are integrated into the sculpture. 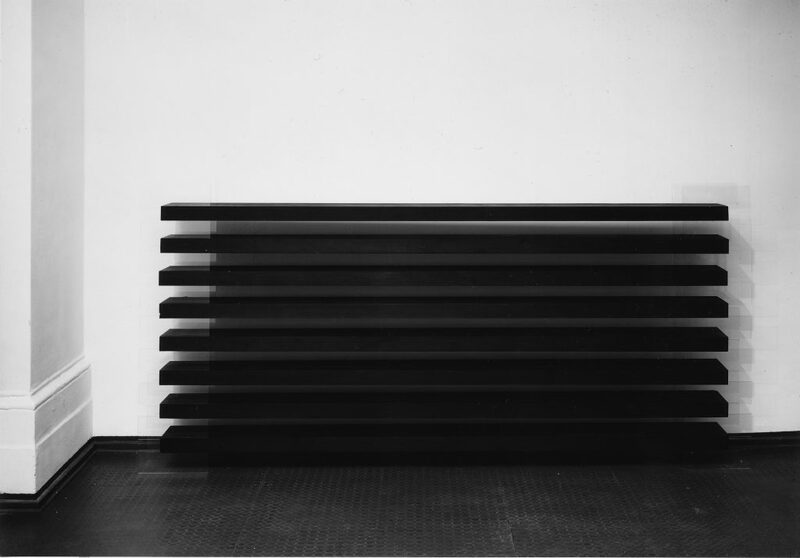 One observes the sculpture from above and consequently sees the levels of glass-plates as creating ambiguity too: they lead one’s glance down towards the floor while at the same time displaying the pictorial qualities of a reflecting surface. 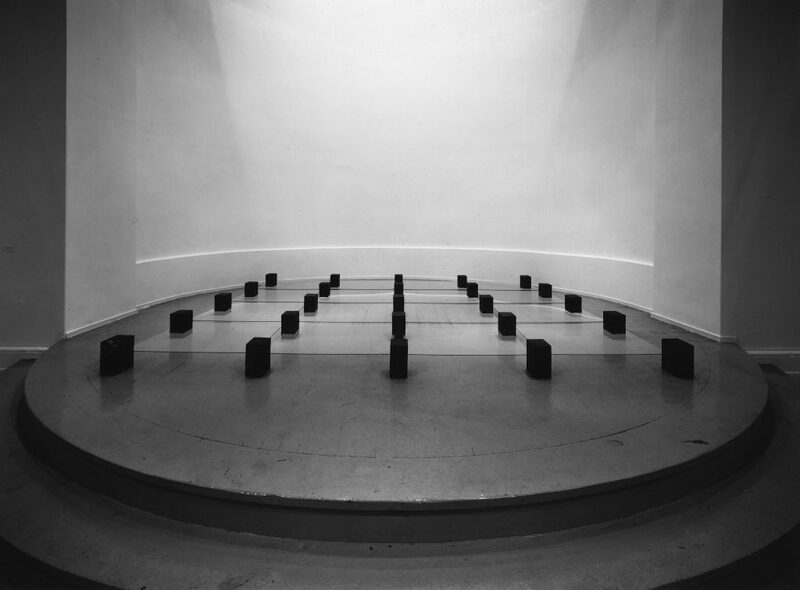 Another aspect of the sculpture’s visual impression is created by light: it both falls through the glass plates and is reflected back by them; it becomes absorbed by the black wooden cubes. Material and immaterial appearances balance each other out. In addition to this minimalist quality, the sculpture also has something playful about it, like a box of building blocks which, in a manner of reduction or extension, can be added to and built upon in numerous ways.